In the States, the perception of the best in Irish cuisine begins and ends in liquid form  beer, whiskey, Baileys. Corned beef and cabbage gets a nostalgic reference or two. And sometimes the lovely potato. These things are all well and good, but for me, I’m all about the bread. Irish soda bread is a bakery staple in March, but, really, it should be clearly called “Irish-American soda bread,” as the American tweaks to the recipe result in a flavor that bears little resemblance real Irish soda bread. For one thing, the Americanized version has twice the sugar; for another, it adds raisins. Both make the bread sweet in a way that wasn’t intended by our Irish ancestors. Add caraway seeds to the mix, and, well, it’s, um, just not one of my faves. 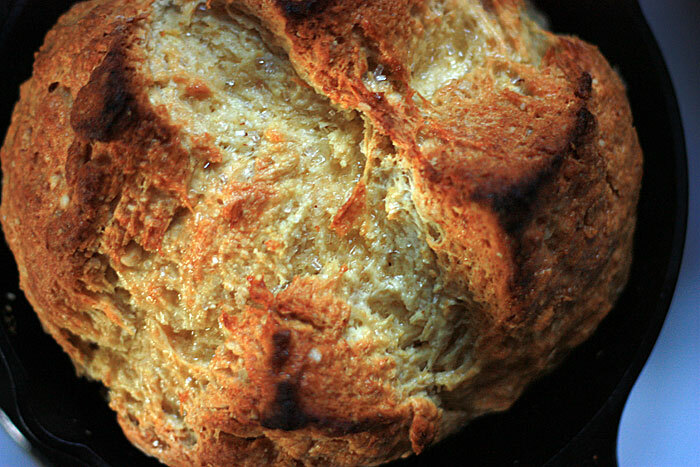 Traditional Irish soda bread, on the other hand, is wonderfully dense and chewy, slightly savory, and a great accompaniment to meals (especially stews and soups). The “soda” in the name, by the way, refers to the use of baking soda as the leavening agent, not to cola. (Think “soda crackers,” not Pepsi 🙂 ). This is an insanely easy bread to make  if you’re squeamish about bread-baking, this the recipe to start with. No yeast to accidentally kill; imperfect kneading is actually desired here (it’s supposed to be shaggy and lumpy); no bread machines, no stand mixers or other special equipment. 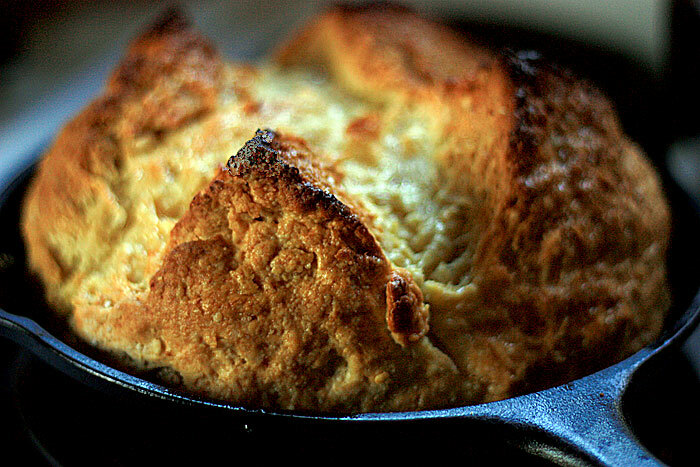 If you have a cast iron skillet, you don’t even have to grease anything (if you don’t, just place the round on a parchment-covered (or greased) baking sheet). Heat the oven to 400 degrees and adjust a rack to the center position. 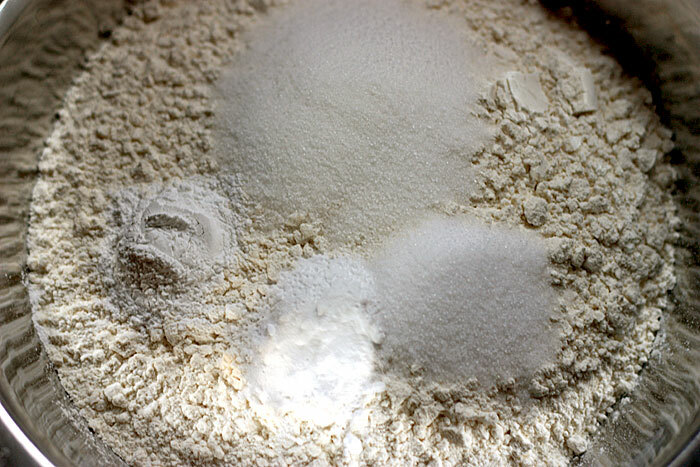 Whisk the flours, baking soda, cream of tartar, salt and sugar in a large mixing bowl. Add the butter and work it into the flour until incorporated, with the mixture resembling coarse crumbs. Make a well in the center and add the buttermilk. Work the liquid into the flour mixture using a fork until the dough comes together in large clumps. Turn the dough onto a work surface and knead briefly (10 to 14 turns) until the loose flour is just moistened. The dough will still be scrappy and uneven. Do not be tempted to over-work the dough, or the bread will be tough. 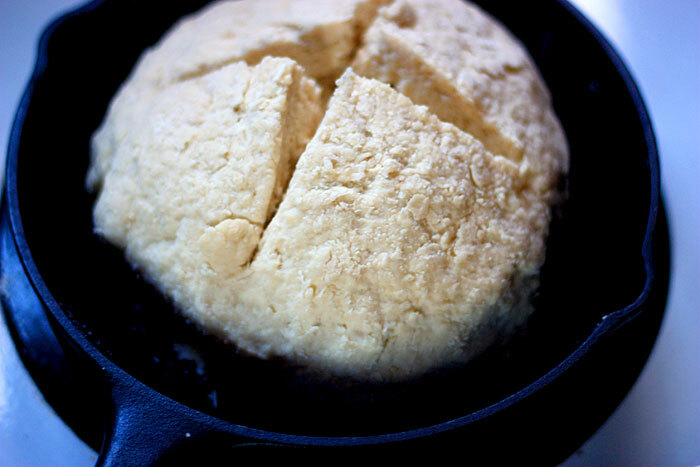 Form the dough into a slightly flattened round about 6 to 7 inches in diameter and place in a cast iron skillet (an 8″ skillet works nicely). Score a deep cross on top of the loaf and place in the heated oven. Bake until golden brown and a tester comes out clean when inserted into the center of the loaf, about 40 to 45 minutes. Remove from oven and brush top with the tablespoon of melted butter. Sprinkle coarse sugar over the butter-moistened areas, if desired. Cool for at least 30 minutes before slicing. Serve slightly warm or at room temperature. Bread will keep for a day or two if tightly wrapped. I’m second generation Irish-American. All of my grandparents were from Ireland, and both my grandmothers baked soda bread every day from recipes they brought with them from Ireland that were handed down through their families going back generations. 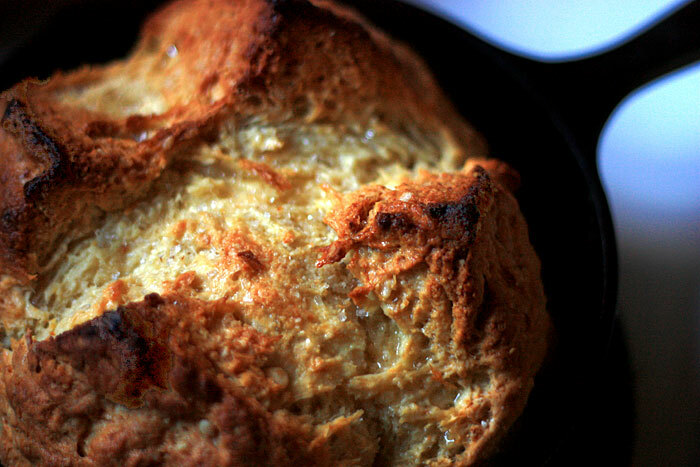 Traditional soda bread has just 4 ingredients– White flour, baking soda, salt (which I omit), and buttermilk. I continue the tradition and make it this way. My paternal grandmother never made it any other way either. My maternal grandmother occasionally threw in some sultanas (small white raisins), or raisins if she couldn’t find sultanas. I think she also added a teaspoon or 2 of sugar in the ones she put raisins in. The bread was never sweet, and never had sugar coating the top like so many of them I see sold in stores around St. Patrick’s Day (I saw THAT plus another abomination at a bakery the other day which had orange zest and dried cranberries–aak!). Oddly enough, even though I’m a purist when it comes to soda bread, I somehow formed an affinity for one that a local-to-me restaurant serves which has dried currents and caraway seeds. When I was a kid my mother used to go crazy every now and then, and bake up a soda bread with shredded cheese and/or herbs or chopped onions or garlic or green onions. It was a nice diversion, but I still always preferred mine plain. My father wouldn’t eat it and she made the mistake of serving her doctored-up soda bread to my grandmother (her mother) only once….LOL.